This original look at the dynamics of international relations untangles the vigorous interaction of domestic and international politics on subjects as diverse as nuclear disarmament, human rights, and trade. An eminent group of political scientists demonstrates how international bargaining that reflects domestic political agendas can be undone when it ignores the influence of domestic constituencies. 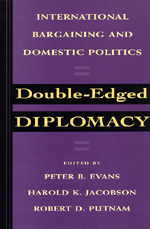 The eleven studies in Double-Edged Diplomacy provide a major step in furthering a more complete understanding of how politics between nations affects politics within nations and vice versa. The result is a striking new paradigm for comprehending world events at a time when the global and the domestic are becoming ever more linked. Peter Evans is Professor of Sociology at the University of California, Berkeley. Harold Jacobson is Jesse Siddal Reeves Professor of Political Science and Director, the Center for Political Studies, at the University of Michigan, Ann Arbor. Robert Putnam is Gurney Professor of Political Science at Harvard University.